Let’s face it, anything which makes your life that little bit easier as a parent is awesome! When baby arrives, suddenly there just doesn’t seem to be enough hours in the day. Trying to keep up with a constant cycle of feeding, changing, crying and sleeping is tiring enough, without trying to juggle chores and taking care of yourself too. If you’re tired of being surrounded by mess but there just isn’t enough time in the day to get everything done, below you’ll discover 10 genius home lifehack tips you absolutely need to try out. Sure, you may not get as much time alone in the bathroom as you’d like, but that doesn’t mean it can’t still be a relaxing, fresh-smelling space. For times when you just don’t have the time, or the energy, to do a full clean, essential oil can work wonders. Just a few drops of essential oil can help make the bathroom smell divine. Try adding a few drops of lavender oil, or any particular oil you prefer, to the inner part of the cardboard tube on the toilet paper roll. It will leave the room smelling wonderful until the toilet paper runs out. Speaking of toilet paper, kids are known to waste a staggering amount of it! If you’re tired of constantly having to buy toilet paper and trying to unblock the toilet because of it, a “Do Not Pass” sign can help. Simply write “Do not pass” on a piece of cardboard, then stick it onto the wall underneath the toilet paper. Measure off approximately two-three sheets, or however much you’d prefer them to use each time before sticking the sign in place. That way, your little one will be able to see exactly how much toilet paper they can use; limiting waste and time spent trying to unblock the toilet! If your rugs and carpets are constantly being moved by the kids or pets, adding Velcro to the back of them can help keep them perfectly in place. Loose rugs aren’t just annoying to keep putting back in place, they’re also potentially dangerous too. By far one of the biggest challenges parents face is finding the time to cook. It’s not so much the cooking, but more the preparation that has to be done beforehand. So, a good way to overcome this challenge is to do all of your food prep on Sundays. Depending upon how much time you have available, you can either do simple food prep such as cutting up vegetables, or go all out and cook a few meals to put in the freezer. Some parents who have large freezers, even choose to take 3-4 days cooking so that they have meals available for almost 2 months. However much free time you have, if you use it to prepare meals in advance you’ll be surprised how much time it saves you during the week. Plus, it limits the need for fast junk foods so you’ll feel better too! A common problem couples face when they become parents, is battles over chores. Therefore, it’s logical to think the solution would be to divide the chores in half. However, rather than doing this, it’s actually more beneficial to divide responsibilities. So, what’s the difference? Well, chores focus on individual tasks such as clean the floor, get the kids dressed and taking out the trash. Responsibilities on the other hand, consist of a combined group of tasks. So, for example on responsibility could be feeding your family. Feeding the family is so much more than simply cooking. There’s the groceries to buy, meal ideas to come up with and dishes to wash and put away. By splitting responsibilities, it can actually help to boost efficiency as each parent will become an expert within their chosen field. It’s a lot like working – when you specialize in something you ultimately become better at it, increasing efficiency. Yes, you read that right! A walnut is surprisingly effective at covering up damaged furniture. All you need to do is rub it over the damage and it instantly hides the worn areas. You only need one and while it may not be a permanent solution, it’s great for covering up damage quickly, such as when guests are unexpectedly popping around. Want to give your stove a quick clean? A dishwasher tablet dipped in a little hot water is fantastic at tackling grease. Simply rub it over the stove and watch as the grease magically disappears. If you’ve got an air conditioning system, you can use it to blow out fresh scented air by simply placing an in-car air freshener to the bars. Over time this can save you a small fortune on spray air fresheners, plus the scent lasts longer too. Another useful benefit of toilet paper tubes is their ability to keep pens organized. Simply stand the tubes up inside a small cardboard box and place the pens inside them. You can decorate the cardboard box to make it look a little more stylish as well. Keeping the linen cupboard tidy isn’t always easy. However, placing each sheet inside a pillowcase can free up a lot of space and help to make it look tidier. That way, it makes it easy to find clean sheets and you can even keep them in matching pillowcases to make it even easier. Overall, keeping the home clean and smelling nice doesn’t have to take hours out of your day. The 10 home life hacks above can help to transform your home in a matter of minutes. Why not try them today? I have definitely gone through this myself and until we had adjusted our daily routines to our baby that is now a toddler, it was a real struggle to keep our house tidy. I often got frustrated when I saw how messy it was getting and I had no spare time for cleaning. I wish I knew about these tricks and tips earlier, haha. They are so clever and out of the box. I had no idea about the fact that you can use your cars air conditioners in your AC. I completely agree that diving the responsibilities is extremely important. You should always make sure that they are divided equally and as soon as the kids are old enough you should try and get them involved! It will save a lot of time plus it is good for them to learn how to perform the chores. I wish I had known tip #10 on making linen cupboards tidy before. But it’s not too late, I can still use it. And tip #1, too! It could have helped me a lot to de-stress. Well, I’m a man and this is not quite my job, my wife cleans the house and she is using 7 and 9 points from your blog. And she does use the point 5…. she divides responsibilities, for me and my son and we help her as much as we can. In fact, I’m doing all she says, but the only thing I;m not doing is to wash the dishes, in rest, I’m doing anything she wants! Well, that is quite alright, wallet. Women do not expect their husbands to do most things in the house, but even if your wife doesn’t tell you about it, I’m pretty sure she really appreciates you helping her with chores. I do the same with my kids, especially with my teen aged boys. I even let them do grocery shopping at times if I really do not have the time, except for my oldest son. He’s just not into that sort of thing but it’s okay. I can send him on errands except at the grocery, haha. As for my husband helping with chores, that’s another story, haha. learnt so much from this.domestic work with little toddlers can never be an easy task. I thank God for having a supportive husband to help out. Augusta, life is never easy if you have a toddler, haha. Your hands are always full if you have a toddler. You need to keep a close watch over him/her because he/she is so active at that stage, and could get injured in a split second. You would need to do this every day until about he/she turns three years old or older, and is more responsible. So funny! My husband used to do that! Not the sign. But measure off the sheets. OK. That will work. But we just didn’t use the loose rugs. Our furniture was not worth saving. Cool trick! But my husband would complain about the smell and start sneezing. For some reason the air fresheners don’t bother him. I just kept mine in boxes. We recently had a baby and I understand how hard it is for a mom to look after the baby, as well as her husband, do household chores, may even have to go to work. Dividing responsibilities definitely help. My wife and I always divide responsibility, when she is in the kitchen or busy with household chores, I will look after the baby, change soiled diapers, if I have to. In case the baby is sleeping, I will be giving hands to my wife to clean the carpet, mop the floor, do the garden. When my wife goes to morning work (she works in the morning shift), I will be doing baby sitting. That’s wonderful of you to help your wife care for the baby and do household chores. I am sure she appreciates your help a lot because it is really difficult to raise a baby and work at the same time, plus do household chores. I would say a husband like you is a rare specie, haha. Thank you very much for being thoughtful and helpful. Thank you for sharing your life hack tips. You have mentioned about adding air freshener to air conditioning. I wan to add a life hack about this. I’ve seen someone who posted a life hack about lemons. Eat the fruit or use it in any meal then make its skin the air freshener. You can leave it in the room too. I find it really nice because it’s all natural. It’s a good alternative to chemical-based air fresheners which are bad for the lungs. I hope you like this healthy life hack as well. These are awesome tricks to make my life easier. Having 1 school aged girl seems like I got 5. Velcro strips at the back of the rugs or carpet will be the first thing I’ll gonna do, I cannot figure out how they walk, the carpet also dislocate. Turning our bathroom into relaxing haven will be extra special already. Knowing these strategies will uplift the tiredness you feel, will keep you relax. The ambience will totally make a big difference no matter how busy your day is. Reading this article and the comments, I have already gained more than 20 Life Hack Tips. Definitely worth sharing with my wife. Greatly appreciated all of this information. If I just have a whole day off. I have already finished all of this interesting articles. Since I only use a couple of minutes for this as a break and getting back to work after reading. But still, it is always worthwhile break. Thank you, melvs, for taking the time to read our articles and learning from them. You’re someone who spends his breaks wisely, never wasting time. And the good thing is, you are open to learning new things about parenthood which is a very good thing. God bless you! We wish you and your wife the best parenthood ever! 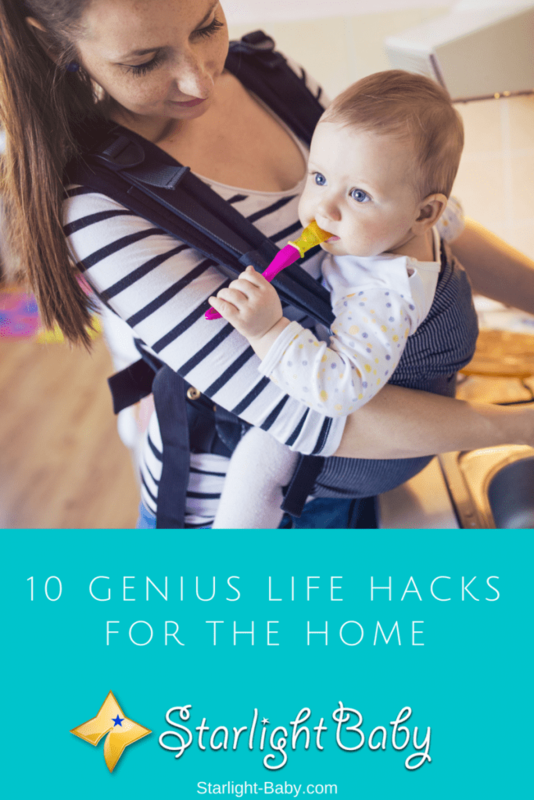 This 10 hacks will help in saving time since most of it will be taken by the baby and the job. You are very much welcome, jessym. We’re really happy that we’re able to make life a bit easier for you at home with these hacks. I’m sure you’ll find most, if not all, of these helpful. Good luck! Cleanliness is next to godliness they say. It’s always disgusting to have ones home dirty and unkempt because you as a mother is busy. It’s always very important make scheduling task on how to take care of your home chores because without doing so, you will find it difficult to take care of everything. Dividing tasks is one good tip because there is no way you can do it all alone without breaking down with stress.